Tune In To The Other Side of Your Trouble-focused Thinking. So often our Western culture has us asking “What’s Wrong With Me?” This happens when we don’t feel physically well, when we don’t feel mentally well and when we don’t seem to be experiencing life the way others around us appear to be experiencing it. It is certainly important to be attuned to our feelings and to recognize when we feel some type of dis-ease. Often, however, we get stuck in patterns of seeing and feeling only the negative in situations-engaging in what I call downward spiral thinking. In these situations, it easy to jump from recognizing a negative feeling to expecting or believing that a “worst case scenario” is at or very close at hand. For instance, we experience a few days of low mental energy and the doldrums and believe the situation to be one of clinical depression (never mind that this is a diagnosis that can only be made by a trained practitioner). We might get rejected from a school we really wanted to attend or a job we thought we were going to be offered and we convince ourselves that no school will admit us or that no employer will hire us. This strategy can be used for all sorts of goals in your life. For instance, instead of beating yourself up for having two cookies and telling yourself that you are just one of those people who can’t follow a diet or a healthy lifestyle, you can put those cookies in perspective. Yes, you may have indulged in two cookies but you had 8 servings of greens this week, hydrated yourself with water and got more exercise than you have in a long time, all while making sure you had 4 well-spaced meals a day. Downward spiral thinking might have brought you to the conclusion that you were a failure at diets and it might have sent you back to the cookie jar to console yourself. “What’s Right With Me?” thinking, however, allows you to see that the cookies are just a blip on the radar of a healthy and nourishing way of life that you have been putting into practice. This same approach can easily be applied to other intentions you set for yourself whether big or small: finding a new job, getting into a school, winning a competition, or limiting social media, being mindful or getting more of your “to-do” list accomplished. A few years back, I heard a talk by Jerry Posner where he discussed examining your attitude to things by asking if something is a Privilege or a Burden. I find the Privilege or Burden approach to be a very effective tool for recognizing the privilege I have when I complain about things. 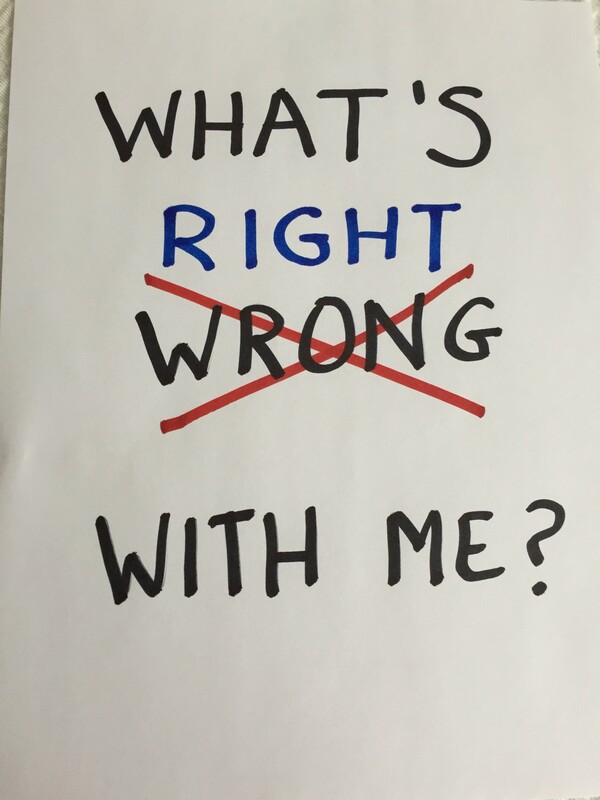 In the same way that the Privilege or Burden practice has you look at both the good and the bad of something you don’t want to do, the “What’s Right With Me?” strategy allows you to recognize that something that may seem to indicate that there is something about you that is off or wrong, is just some thing among many things about you and that many of these things are good. Do We Need to Have Control Over Our Feelings?